Juniors can sign up to take the PSAT-NMSQT at RCHS during October (on a Wednesday during the school day.) We highly recommend this for any student that intends to take either the SAT or the ACT for their college applications. Sophomores can sign up to take the PSAT-10 (designed for 10th graders). The PSAT-10 is offered at RCHS usually in March. Make sure you sign up in advance as the test is only offered one time per year. Why is it important to take the PSAT? If you take the PSAT, you can connect your scores to your College Board account and then use FREE test-prep resources provided by KHAN Academy. This is the best test-prep that we can recommend. First, because its free! But it's also one of the most comprehensive test-prep programs out there. The best part is that it will take your PSAT scores and develop individualized test prep based upon your performance on the PSAT. For example, you may have rocked Algebraic Expressions on your PSAT so you probably don't need to practice that as much.... but maybe a weakness for you was Words in Context (part of the EBRW) and you'd really benefit from practicing that a lot more. 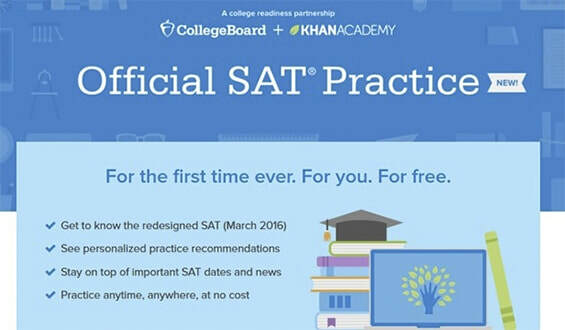 Khan Academy will use how you performed on your PSAT and give you customized preparation for you to use.